I'd like to see reports of someone with 5 star G8-9 bounty hunters(even including Bossk) unlocking the 5 star Chewie. That should be reasonable to unlock. Not going to hold my breath though. Close!! I said 5 star hunters. My 5 star hunters have about 55% of the power of your hunters. I started that No - Whine thread —> to work out optimal mods, kill order etc. 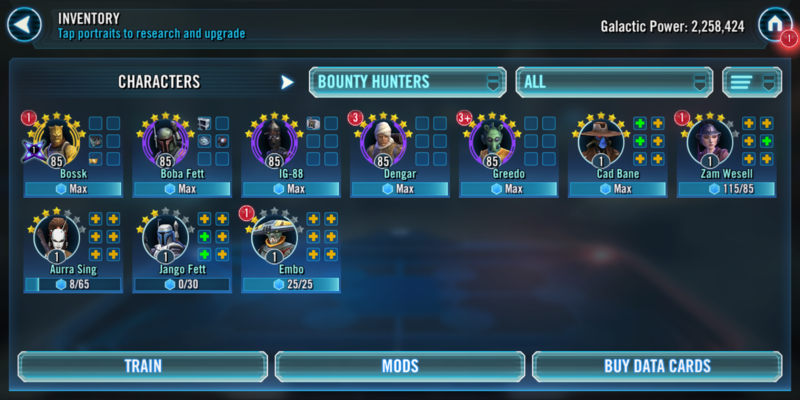 You are unlikely to find a win using only 5* characters if only because nobody has only 5* bounty hunters. I do. Well, Dengar is 10 shards away from his 5th star. I only started playing in April yet unlocked every legendary toon the first time their event came after I cleared level 60 except Thrawn(because I loathe Phoenix Squad). Edit: My shipments had the shards I needed for Dengar. Purchased them, upgraded Dengar to 5*, got completely obliterated(heck one time I got to take one turn with Dengar at red health, all others dead, even Fett.) with most tries only having 2 or 3 hunters when I finally got to go. Uninstalled game. Been a good run guys, hopefully y'all find what you are looking for in this game. I could not. There is a F2P option, but there is no CASUAL option. zBossk, zFett, zIG, Greedo and Dengar. All G12. Pretty good mods. Crushed by Tier 7. Repeatedly. Not even close. Seriously EA? Super unpopular opinion: This is completely doable as a f2p. It doesn't have to be a cash grab. I got 7* chewie with this team: g12 zBossk, g12 Boba, g11 Greedo, g11 IG-88, g9 Dengar. They don't have amazing mods. It took me about 3 or 4 tries. I've never paid a cent in this game. But yes, it's doable as a f2p and without a maxed g12 team. Super unpopular opinion: This is completely doable as a f2p. It doesn't have to be a cash grab. I got 7* chewie with this team: g12 zBossk, g12 Boba, g11 Greedo, g11 IG-8, g9 Dengar. They don't have amazing mods. It took me about 3 or 4 tries. I've never paid a cent in this game. I spent $20 on the bossk + ship pack and geared the rest (except Boba) mostly after that time. This was really doable for ftp, it’s just that not a lot of people had committed a ton of gear to BH previously. I’m guessing that will change now. Did it with G12 zBoba, G11 ig88, G10 Zam, G9 Greedo and G9 Dengar. The stars of the show and last survivor were Boba (his zeta was of a great help here) and Dengar trolling R2 for the fight. I won't be able to get a seventh star though. I'm already farming and gearing my BH for TBs anyway, I'll get it next time, it's OK. It did take me 5 tries but I’d recommend repeating until you get good RNG. I found that taking out Chewbacca, then Leia,then Han Solo, and the rest is best. We know it is doable. That is not the issue. The issue is it is ONLY doable well above what has been required for other Legendary events in the past. People geared their BH teams expecting Thrawn difficulty and got 2-3 steps above that. To be fair, I completed 5* with my BH squad (Boba G11, Dengar G9, Zam G9, Greedo G9, Cad G8), no Zetas, just a couple Omegas. However, that's with multiple mod swaps (don't get me started on not being able to use my sliced 6-dot mods on ANY of my BHs), and it's still 7* Thrawn difficulty for a 5* Chewie. Who the heck really thought you needed G11 and zetas to unlock Chewie at 5*. @terascque You don't. 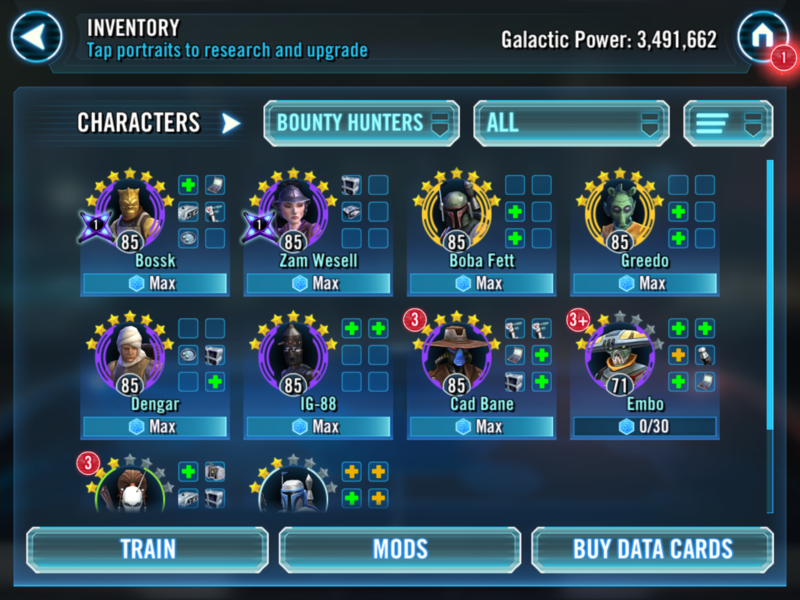 I unlocked 5* Chewie with a mix of G8/G9 and only 1 omega with my arena mods. Pulled off Tier 7 with the top 5 there average mods. It's a bit rng, but Bossk is a must in lead, and you have to clear chewie quick! I 5* unlocked him with a embo lead. 7*G9 boba and greedo 5*g8 bossk and 5*g7 cad and embo @5*. The only omegas were on boba. Only boba and greedo were the only 2 level 85.. no awesome mods. I couldn't even kill one person under boba or bossk lead. I can’t beat it. I don’t have dengar farmed, which is infuriating bcuz R2D2 WAS NOT THERE. He was with Luke! The story doesn’t even make sense, and stealth makes it geared for dengar. Can’t beat the 7* tier bcuz of that. Extremely frustrating that others can beat it with lesser squads just by having him. The event was very doable with the right mods. Speed as always is the key. 20 hours later, I'm a proud 7* Chewy owner too! 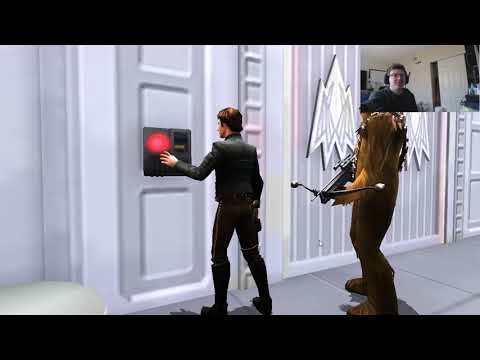 Let Chewy get a bunch of buffs, execute him and then slowly kill the rest. Loved the event! They gave us a path with the BH ships. Got my 7 star Chewie. Nice work CG! Any advice would be appreciated though mail. Got Chewbacca to 6*. Tried with boba fett died before I got a turn. Bossk 6* 47/100 trying get him ready within event time to 7*. Boba g11 bossk g8 dengar g8 cad bane g10 and ig88 g11. Also is bossk leader zeta needed to get Chewbacca to 7*. I'm genuinely a bit sad to be honest, I had hoped that this would be a decent event for CG to demonstrate they are back on board with the community, and more importantly, to give the community a reason to be behind them. I am not about flaming or raging at every step and generally just browse the forum but I have defended this event "only needing bounty hunters" in Guild chat as being a genuine effort by CG to show willing. Turns out it seems to be quite a sly move and now I'm considering where we all stand. Gear 11 to unlock at 5*? Is that where we are at now? Look, I appreciate that you are trying to make us progress CG, but give us a bloody fighting chance. Alongside farming for HSTR and cargo ships and smugglers run events, as well as progressing for TB and TW and all the rest, most of the bounty hunters in game require so much log jammed gear that getting them to gear 10 is an achievement for most, never mind beyond. I even cynically opened the store and was surprised not to see a "Gear Pack" for sale for this event. I am not saying that I wanted this event to be a walk over or to be simple. I genuinely wouldn't be mad about a Gear 12 recommendation for 7*, but come the hell on, your two flagship characters (Jedi Rey and Commander Luke) dont require anything like this level of investment. Why is everyone so mad about this? Chewie is an iconic character and hes a badass. And the bounty hunters? I think that's a great move with all the work they've been giving them. I've been gearing up my bounty hunters since bossk has been farm able. I p as sued tier 5 easy with g11 5*bossk. G9 dengar. 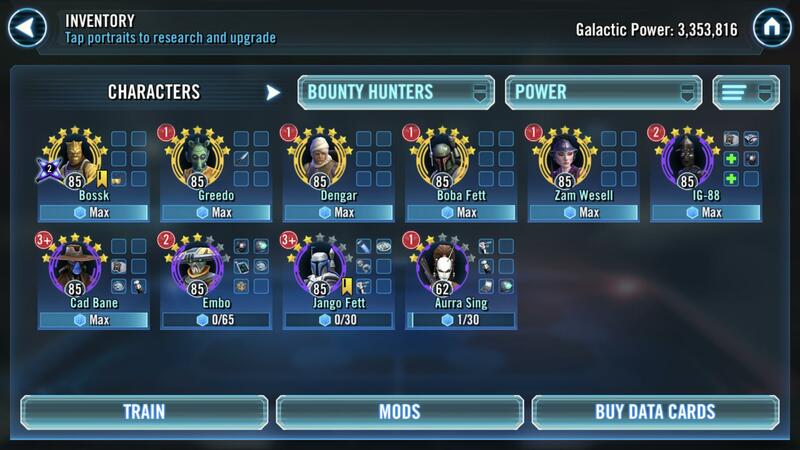 G10 boba 5* g9 embo and g9 zam. It was easy. All you need is decent characters. And the people who are mad about this are the people who cant get him. And are upset that it's too hard for them. With legendary characters everyone remembers how hard thrawn was when he came out. Then we get Phoenix zetas and it's easy to 7 star him. Itll be the same thing with bounty hunters especially when you can farm jango and embo. Who are definitely the keys to this event. Think about long term!!! Everyone will get chewie just like thrawn with putting some effort into bounty hunter toons. Why is everyone so mad about this? As I've said before - because a lot of people these days think they deserve everything when they want it with no effort or expense to themselves. Generation Entitlement. Short and sweet: No 5 Star Legendary should require SIGNIFICANTLY higher gear than a 7 star Legendary. Edit: Nor should it require 7 stars and higher gear than a 7 star legendary. Took me at least ten hours.